In this paper we present a Monte Carlo radiative transfer technique for calculating synthetic spectropolarimetry for multi-dimensional supernova explosion models. The approach utilises “virtual-packets” that are generated during the propagation of the Monte Carlo quanta and used to compute synthetic observables for specific observer orientations. Compared to extracting synthetic observables by direct binning of emergent Monte Carlo quanta, this virtual-packet approach leads to a substantial reduction in the Monte Carlo noise. This is vital for calculating synthetic spectropolarimetry (since the degree of polarisation is typically very small) but also useful for calculations of light curves and spectra. We first validate our approach via application of an idealised test code to simple geometries. We then describe its implementation in the Monte Carlo radiative transfer code ARTIS and present test calculations for simple models for Type Ia supernovae. In this paper we study the very early light curve of supernova 2014J (SN 2014J) using the high-cadence broad-band imaging data obtained by the Kilodegree Extremely Little Telescope (KELT), which fortuitously observed M 82 around the time of the explosion, starting more than two months prior to detection, with up to 20 observations per night. These observations are complemented by observations in two narrow-band filters used in an Hα survey of nearby galaxies by the intermediate Palomar Transient Factory (iPTF) that also captured the first days of the brightening of SN 2014J. 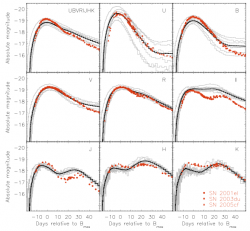 Using analytical light curve models, we derive constraints on the progenitor system. The evolution of the light curves is consistent with the expected signal from the cooling of shock heated material at a distance of about a solar radius. This could be due to heated material of the progenitor, a companion star or pre-existing circumstellar environment, e.g., in the form of an accretion disk. 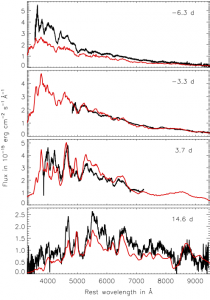 Structure seen in the light curves during the first days after explosion could also originate from radioactive material in the outer parts of an exploding white dwarf, as suggested from the early detection of gamma-rays. On September 23/24 2014, I was co-chair of the splinter session Explosive Stellar Transients which was held in the context of the Annual Meeting of the Astronomische Gesellschaft 2014. With 25 oral contributions from various European countries and more than 50 participants our splinter session was a great success. Detection of a nickel line in the Supernova SN2014J, some two weeks after the explosion. The position of the signal agrees within the measurement error with the position of the supernova (indicated by the cross). Picture from MPE press release. of radioactive 56Ni. The 56Ni is commonly believed to be buried deeply in the expanding supernova cloud. 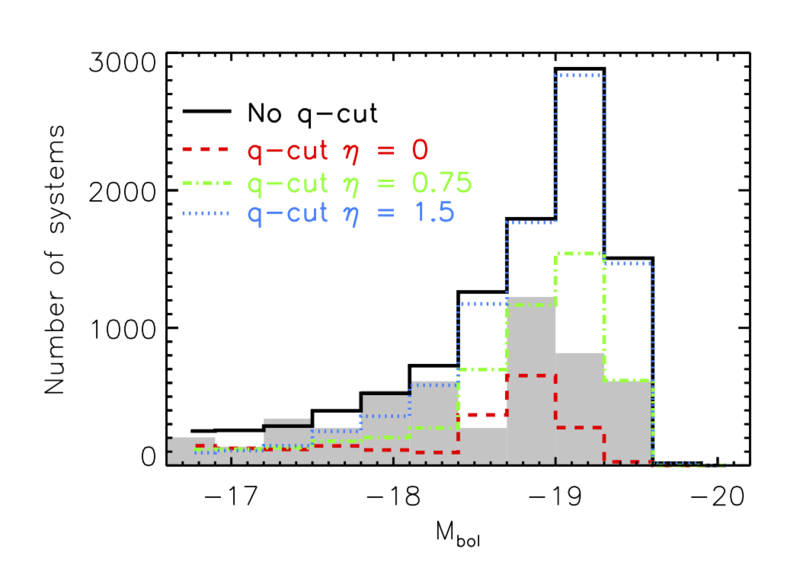 Surprisingly, in SN2014J we detected the lines at 158 and 812 keV from 56Ni decay (half-life 6.1 days) earlier than the expected several-week time scale, only ~20 days after the explosion, and with flux levels corresponding to roughly 10% of the total expected amount of 56Ni. Some mechanism must break the spherical symmetry of the supernova, and at the same time create a major amount of 56Ni at the outskirts. A plausible explanation is that a belt of helium from the companion star is accreted by the white dwarf, where this material explodes and then triggers the supernova event. Paper published in Science, Volume 345, Issue 6201, pp. 1162-1165 (2014), full text available at http://de.arxiv.org/abs/1407.3061. Press release at the Max Planck Institute for Extraterrestrial Physics. Time evolution of our merger model (colour-coded is the logarithm of the density). Initially, the two CO WDs (0.9 M⊙ and 0.76 M⊙ , respectively) orbit each other with a period of ∼36 s. The first six panels show the inspiral phase. At t = 72 s, the detonation is ignited (indicated by the crosshairs in the middle right panel). The bottom panels show how the detonation front (black line) propagates. SN 2010lp is a subluminous Type Ia supernova (SN Ia) with slowly-evolving lightcurves. Moreover, it is the only subluminous SN Ia observed so far that shows narrow emission lines of OI in late-time spectra, indicating unburned oxygen close to the centre of the ejecta. Most explosion models for SNe Ia cannot explain the narrow OI emission. In this Letter (The Astrophysical Journal Letters, Volume 778, Issue 1, article id. L18, 2013), we present hydrodynamic explosion and radiative transfer calculations showing that the violent merger of two carbon-oxygen white dwarfs of 0.9 and 0.76 solar masses, respectively, adequately reproduces the early-time observables of SN 2010lp. Moreover, our model predicts oxygen close to the centre of the explosion ejecta, a pre-requisite for narrow OI emission in nebular spectra as observed in SN 2010lp. In a recent review paper (Frontiers of Physics, Volume 8, Issue 2, pp.116-143, 2013) we describe our current understanding of Type Ia supernovae (SNe Ia) from a synthesis of theory and observations. I have contributed the discussion of the observational display of SN Ia explosion models, the section on peculiar subtypes of SNe Ia and parts of the summary of observational properties. Full text available at http://de.arxiv.org/abs/1302.6420. Brightness distribution of violent WD mergers. Black solid histogram shows all CO WD mergers from population synthesis, while coloured histogram lines show the brightness distributions when more stringent mass ratio constraints are assumed. Grey scale shows the observational peak brightness distribution of 74 SNe Ia from the volume-limited sample of Li et al. ; observations are scaled up to enable comparison with the distribution shapes from our models. In a recent paper (Monthly Notices of the Royal Astronomical Society, Volume 429, Issue 2, p.1425-1436, 2013), we investigate the brightness distribution expected for violent mergers of white dwarf (WD) binaries. Determining the brightness distribution is critical for evaluating whether such an explosion model could be responsible for a significant fraction of the observed population of SNe Ia. We argue that the brightness of an explosion realized via the violent merger model is determined by the mass of nickel 56 produced in the detonation of the primary WD. 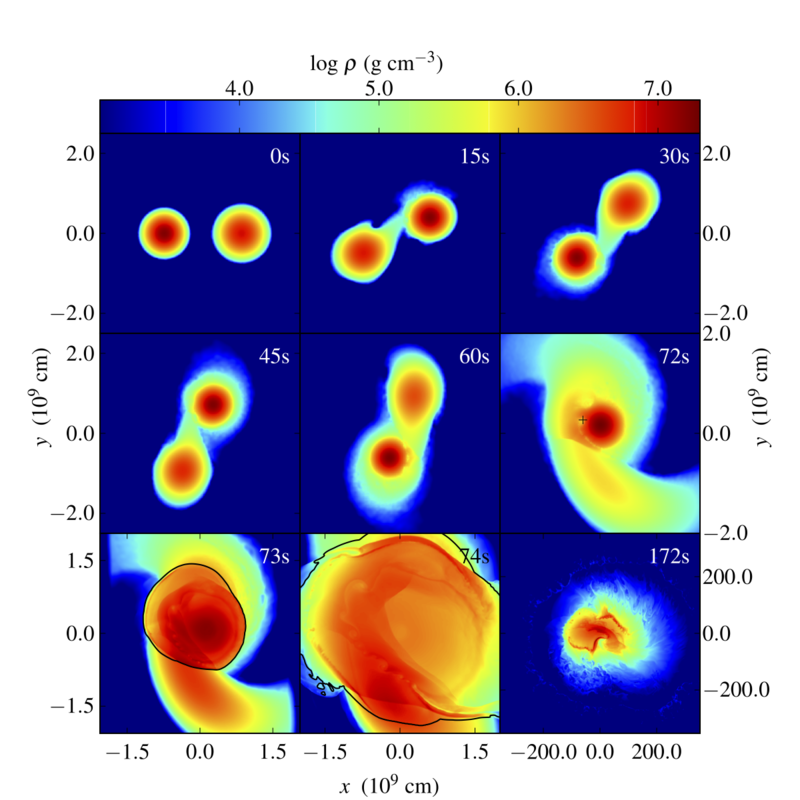 We use a set of sub-Chandrasekhar mass WD detonation models to derive a relationship between primary WD mass and expected peak bolometric brightness. We use this relationship to convert the masses of merging primary WDs from binary population models to a predicted distribution of explosion brightness and find a striking similarity between the shape of our theoretical peak-magnitude distribution and that observed for SNe Ia: our model produces a brightness distribution that roughly covers the range and matches the shape of the one observed for SNe Ia. Full text available at http://de.arxiv.org/abs/1209.0645. Spectral evolution of our deflagration model (red) from −6.3 to 14.6 days (with respect to maximum light). For comparison the observed spectra of the 2002cx-like SN 2005hk are overplotted in black. 2002cx-like supernovae are a sub-class of sub-luminous Type Ia supernovae. Their light curves and spectra are characterized by distinct features that indicate strong mixing of the explosion ejecta. Pure turbulent deflagrations have been shown to produce such mixed ejecta. In this paper, we present hydrodynamics, nucleosynthesis and radiative transfer calculations for a 3D full-star deflagration of a Chandrasekhar-mass white dwarf. Our model is able to reproduce the characteristic observational features of SN 2005hk (a proto-typical 2002cx-like supernova), not only in the optical, but also in the near-infrared. Since our model burns only small parts of the initial white dwarf, it fails to completely unbind the white dwarf and leaves behind a bound remnant of ~1.03 solar masses — consisting mainly of unburned carbon and oxygen, but also enriched by some amount of intermediate-mass and iron-group elements from the explosion products that fall back on the remnant. We discuss possibilities for detecting this bound remnant and how it might influence the late-time observables of 2002cx-like SNe. Paper published in Monthly Notices of the Royal Astronomical Society, Volume 429, Issue 3, p.2287-2297 (2013), full text available at http://de.arxiv.org/abs/1210.5243. UVOIR maximum-light spectrum of SN 2011iv (black curve). 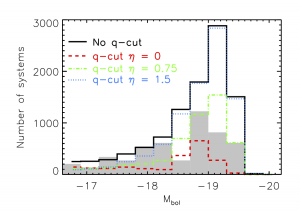 The blue, red, and orange curves represent model spectra generated from the zero-metallicity delayed-detonation N100 model, the W7 model, and the solar-metallicity polluted W7Z⊙ model, respectively. In this Letter (The Astrophysical Journal Letters, Volume 753, Issue 1, article id. L5, 2012), we present the first maximum-light ultraviolet (UV) through near-infrared (NIR) Type Ia supernova (SN Ia) spectrum. 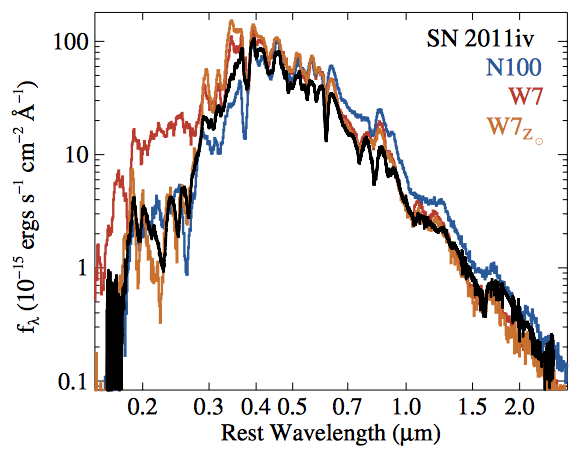 This spectrum of SN 2011iv was obtained nearly simultaneously by the Hubble Space Telescope at UV/optical wavelengths and the Magellan Baade telescope at NIR wavelengths. These data provide the opportunity to examine the entire maximum-light SN Ia spectral energy distribution. Since the UV region of an SN Ia spectrum is extremely sensitive to the composition of the outer layers of the explosion, which are transparent at longer wavelengths, this unprecedented spectrum can provide strong constraints on the composition of the SN ejecta, and similarly the SN explosion and progenitor system. Through a comparison with explosion models, we find that both a solar-metallicity W7 and a zero-metallicity delayed-detonation model provide a reasonable fit to the spectrum of SN 2011iv from the UV to the NIR. Full text available at http://de.arxiv.org/abs/1202.5301. The nearby supernova SN 2011fe can be observed in unprecedented detail. Therefore, it is an important test case for Type Ia supernova (SN Ia) models, which may bring us closer to understanding the physical nature of these objects. Here, we explore how available and expected future observations of SN 2011fe can be used to constrain SN Ia explosion scenarios. We base our discussion on three-dimensional simulations of a delayed detonation in a Chandrasekhar-mass white dwarf and of a violent merger of two white dwarfs (WDs)—realizations of explosion models appropriate for two of the most widely discussed progenitor channels that may give rise to SNe Ia. Spectral evolution of our delayed detonation N100 (left) and merger model (right) from 6 to 27 days after the explosion. The angle-averaged spectrum is plotted in black, while 25 spectra for representative viewing angles are shown in gray. For comparison the observed spectra of SN 2011fe are over plotted in red assuming an explosion date at August 23.7. 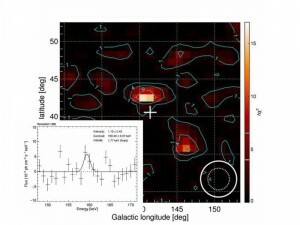 Although both models have their shortcomings in reproducing details of the early and near-maximum spectra of SN 2011fe obtained by the Nearby Supernova Factory (SNfactory), the overall match with the observations is reasonable. The level of agreement is slightly better for the merger, in particular around maximum, but a clear preference for one model over the other is still not justified. Observations at late epochs, however, hold promise for discriminating the explosion scenarios in a straightforward way, as a nucleosynthesis effect leads to differences in the 55Co production. SN 2011fe is close enough to be followed sufficiently long to study this effect. Published in The Astrophysical Journal Letters, Volume 750, Issue 1, article id. L19, 7 pp. (2012), full text available at http://de.arxiv.org/abs/1203.4839. One of the most important questions regarding the progenitor systems of Type Ia supernovae (SNe Ia) is whether mergers of two white dwarfs can lead to explosions that reproduce observations of normal events. In this letter (The Astrophysical Journal Letters, Volume 747, Issue 1, article id. L10, 2012), we present a fully three-dimensional simulation of a violent merger of two carbon-oxygen white dwarfs with masses of 0.9 solar masses and 1.1 solar masses combining very high resolution and exact initial conditions. A well-tested combination of codes is used to study the system. We start with the dynamical inspiral phase and follow the subsequent thermonuclear explosion under the plausible assumption that a detonation forms in the process of merging. We then perform detailed nucleosynthesis calculations and radiative transfer simulations to predict synthetic observables from the homologously expanding supernova ejecta. We find that synthetic color light curves of our merger, which produces about 0.62 solar masses of 56Ni, show good agreement with those observed for normal SNe Ia in all wave bands from U to K. Line velocities in synthetic spectra around maximum light also agree well with observations. 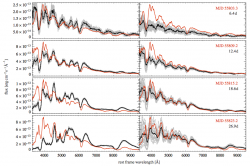 We conclude that violent mergers of massive white dwarfs can closely resemble normal SNe Ia. Therefore, depending on the number of such massive systems available these mergers may contribute at least a small fraction to the observed population of normal SNe Ia.